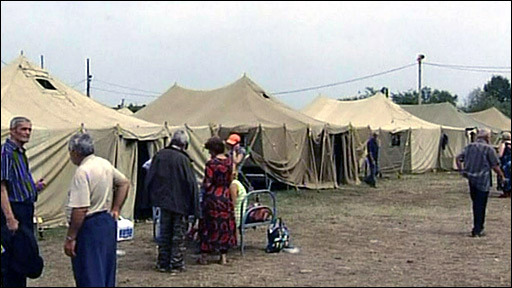 There have been conflicting accounts of events in and around Georgia's breakaway region of South Ossetia, which have not been possible to verify. The spokeswoman for the head of South Ossetia's separatist government, Zarina Sanakoeva, has crossed into Russia and gave this account by telephone to the BBC News website's Neil Arun. We left our town because the situation there is worse than anything I've seen in 18 years of conflict. Houses are being hit by rockets and heavy artillery, aircraft are bombing the roads. There had been skirmishes all week but until Thursday night, no-one thought it was going to get any worse. After all, fighting is a fact of life if you grow up in Tskhinvali - you learn to live with it. Some of us even sleep through shelling. The early part of Thursday evening seemed quieter than it had been recently. I went to bed hoping to get a good night's sleep. Instead I was woken up by the sound of explosions, very close and very loud. For the first time, the whole family decided to hide in the basement of our building. The children were making a lot of noise and we wanted to calm them down, to bring them food. But with the bombing, even going upstairs into the house felt dangerous. The next day, there was no electricity, no water and no gas. The mobile phone networks were also down. We left Tskhinvali on Friday evening. I didn't see any Georgian troops but there were rumours they had reached the southern part of the town. As we drove towards North Ossetia, we passed Russian troops going the opposite way. Some of them stopped and asked about the situation in Tskhinvali. They wanted to know what they were heading towards. We passed the village of Java, where my grandparents live. Their house has lost its windows and its roof. Twenty metres from their house was a giant crater, where a bomb had landed. 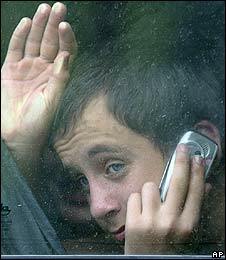 After we crossed the border into North Ossetia, my mobile phone began working again. It was full of messages from friends and family, asking if we were okay. The men in my family are away, fighting. My brother is among them – I'm worried about him, he doesn't have a mobile phone. I don't know where any of my friends are and I fear the worst. I wonder when I will see my house in Tskhinvali again and I wonder how all the people left behind in the city are coping. When people around you are so scared, it's hard not to feel fear yourself. I keep thinking of all the films about war I've seen, all the war books I've read. I realise that nothing in them really prepared me for what has happened. Most computers will open PDF documents automatically, but you may need to download Adobe Acrobat Reader.